Low clouds backlit by the rising sun. 1/50 @f22, ISO 400. What a difference a day makes. 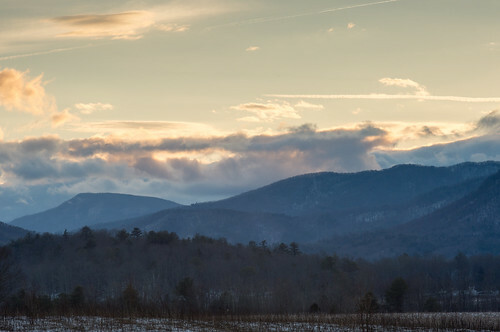 I entered the Cades Cove loop through the already open gate at 7 a.m. and headed straight to the location I had decided on yesterday, passing only one other person along the way. The sky was clear and there was a cloud layer that was moving fast across the top of the mountains. It is exciting to imagine photos coming together in your mind as you are driving along and it took everything I had not to stop and start shooting prior to arriving at my pre-planned destination. Once I parked and set up my tripod and camera with a 24-70mm, I forced myself to take a breath and relax. While it seems everything is happening fast, often there is more time than you realize. It is better to get it right than realize your ISO was still on 3200 from the night before. In this case, I worked the sunrise for almost 30 minutes before it was completely up over the mountain. In that time I was able to use multiple lenses, bracket, try out my new split neutral density filters and move about 50 yards down the road for a slightly different composition. Switched to the 24-70mm with a Cokin split neutral density filter just as the sun rose above the clouds. You can see how the clouds just stuck to the top of the mountains. 1/60 @ f22, ISO 200. Remember as the sun is rising and consuming your attention, all that great light is falling somewhere and that somewhere is behind you. When I did finally turn around I immediately was drawn to the tops of the mountains and those clouds which were slightly backlit, yet at the same time light was falling on the face of the mountain. I only had to cross the street and climb a slight embankment when I saw that the sun was hitting the trees in the foreground. Once the sun rose above the clouds I turned around and was treated to some wonderful light. 1/40 @ f22, ISO 200. When I see layers leading into a photograph, I instantly think of long lenses and compression. It doesn't matter if the layers are created by color, tonal quality, or texture, compressing and flattening the scene makes a pleasing photograph. On my drive in I saw plenty of deer and thought it was time to move to a new location and with only a few other cars on the loop, I was able to exit and re-enter in about 20 minutes. Once back on the loop I stopped a few times and waited in locations where I had seen wildlife the previous day and sure enough I spotted four deer off in the distance in the same field I had seen the coyotes. They were a fair distance off so I grabbed my 300mm with a 2x converter. It was then that I noticed there were three bucks and a doe. After waiting and watching it became clear that the bucks were going to interact and sure enough they locked antlers several times. It also became clear that they were slowly moving in a direction that would have them crossing the road just below where I had spent the morning. I debated staying put, but sometimes you have to take a chance and move. I'm glad I did. As I parked the deer were still heading in the same direction so I moved to the exact location that I had taken the above photograph earlier. As the deer continued to head in my direction they were still slightly backlit, but after they crossed the road the light was perfect and when they started to run as a car approached, I just started shooting. I had a long lens on which was nice to capture the deer, but meant I was unable to include any background or context. 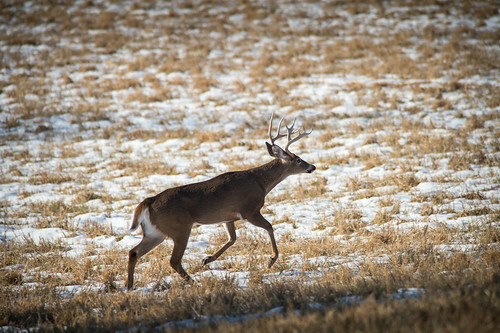 I moved to higher ground in order to capture this photo of a male whitetail deer. Thinking ahead in order to place yourself in the right spot is key to getting the photograph you envision. 1/800 @ f7.1, ISO 200. 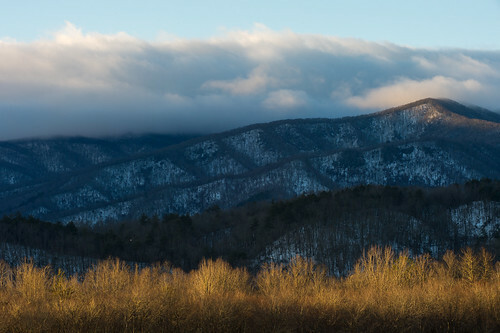 By mid-morning I decided to pack up and leave Cades Cove and explore more the Great Smoky Mountains, but not before one more stop at Tipton place. 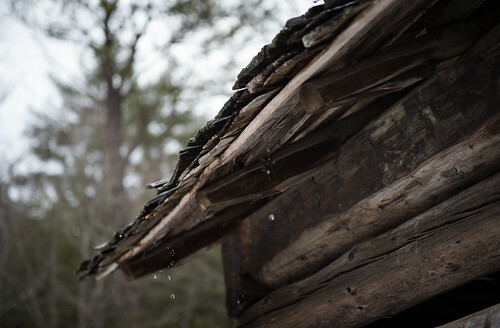 Only this time I was across the road photographing the double-pen corn crib and cantilever barn when the dripping water from the roof caught my attention. Up until this point everything I had photographed, other than wildlife, was medium or wide angle, so it was nice to get a detail shot. Sometimes it's about the details. 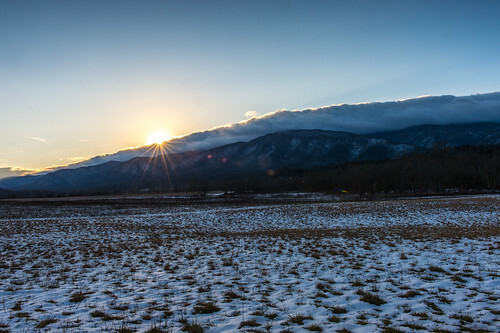 With locations like Cades Cove, the tendency is to focus only on the vistas, but sometimes a photo like this tells the story of melting snow. 1/640 @ f2.8, ISO 200. On the way to Gatlinburg, I stopped at the Sugarlands visitor center and looked around the museum. This is a great thing to do in the middle of the day and besides giving you a break, it gives you some history and context, which may lead to additional photo ideas. Additionally, rangers can be a wonderful source of information on hidden shooting locations. 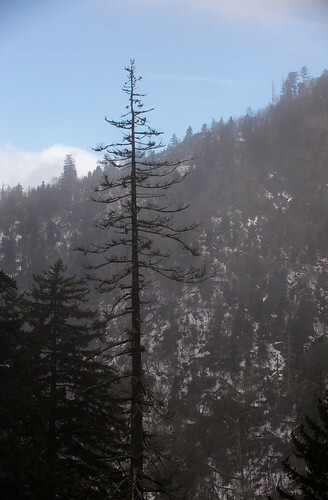 After leaving the visitors center, I thought I would drive the 13 miles to the Newfound Gap outlook and scout out locations for the next morning. It is a really pretty drive although it soon became apparent as I increased in elevation that I would be entering the clouds by the time I reached the summit. Of course, these were the same clouds that I had been photographing in the morning. So before I was fully in the clouds, I stopped about a quarter mile from the top and took a few photos of the clouds moving by which added some softness to the bare trees. Tomorrow I plan on heading back to the summit to photograph the sunrise even though the forecast calls for rain.